This masterly adaptation of George Orwell's chilling parable about totalitarian oppression gives harrowing cinematic expression to the book's bleak prophetic vision. In a rubble-strewn surveillance state where an endless overseas war props up the repressive regime of the all-seeing Big Brother, and all dissent is promptly squashed, a profoundly alienated citizen, Winston Smith (thrillingly played by John Hurt), risks everything for an illicit affair with the rebellious Julia (Suzanna Hamilton) in a defiant assertion of humanity in the face of soul-crushing conformity. Through vividly grim production design and expressionistically desaturated cinematography by Roger Deakins, Michael Radford's 1984 conjures a dystopian vision of postwar Britain as fascistic nightmare—a world all too recognizable as our own. More importantly, is this our first thread that is also a phone number? That's- a couple blocks from where I'm at right now. It's either one hell of a coincidence, or Domino is abusing his mod powers to send me vague threats. Any MGM owned title that Twilight Time released is gonna be readily available for any of the boutique labels to license once the TT 3-year window lapses. Kino has done a handful already. It'll likely just depend on if any boutique label sees sales potential. Any indication as to whether it will have the mixed Eurythmics/Muldowney soundtrack or not? That announcement is a bit underwhelming given the lack of “and More!”. 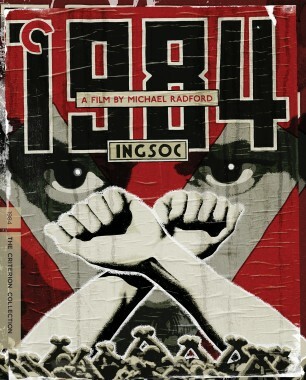 While a new 4K Restoration is welcome, there is so much that could have been added, I really would have expected a 2 disc release with the both versions of the film plus many extras on the book, Orwell, the music/Eurythmics, the early BBC versions, cultural significance, maybe even the Apple ad. Great. That's going to annoy me almost as much as when I noticed that This Is Spinal Tap is spine number 12. With Radford and Deakins' full participation in the Criterion release, it's safe to assume that The Eurythmics score will NOT make it. Buy the CD! IMDb wrote: Virgin Films exercised their right of final cut, and replaced most of Muldowney's score with the Eurythmics score, for the film's theatrical release (some of Muldowney's score remained, particularly the state anthem, "Oceania, 'Tis for Thee"). Radford was displeased with this development, and retaliated by withdrawing the film for consideration for BAFTA award for Best Picture. When the film did win the Evening Standard award for Best Film of the Year, Radford used his acceptance speech at the nationally televised ceremony to denounce the Eurythmics involvement. The Eurythmics released a statement that they were unaware of the dispute, and would not have accepted the commission if they had known it was done against the director's consent. Both are given a "Music by" credit on the Criterion credits list. a US home-video version (TGG Direct - paired with "Megaville"), which has a de-saturated look and does not contain the Eurythmics songs (which director Michael Radford did not approve of). a UK home-video version is more saturated (in color) and has a mix of Dominic Muldowney's score and Eurythmic songs. Note that the cover has both Muldowney AND Eurythmics credited as "music by" whereas the imdb info just has Muldowney. The Twilight Time blu-ray offered the option of the Muldowney score and the Eurythmics/Muldowney mix tracks. This release also is presented in the de-saturated look that is preferred by Radford. Last edited by Close The Door, Raymond on Mon Apr 15, 2019 7:33 pm, edited 1 time in total. Not to be confused with cellist Dermot Mulroney! Yep, agreed. Hopefully there's more to come; all of that stuff would be a no-brainer! ...Michael Radford's 1984 conjures a dystopian vision of postwar Britain as fascistic nightmare—a world all too recognizable as our own. This seems like a wilful distortion of Orwell's intentions. The novel (to which the film, as I recall, is pretty faithful) is a dystopian vision of postwar Britain as a communist nightmare, not a fascistic one. Plus that "all too recognizable" part. I mean... seriously? Communist would also be pretty distorted. There aren't too many indications of the system of government beyond authoritarian. Orwell was a Democratic Socialist (Although how good of one is up for debate.) and the Metropolitan London Police kept files on him because of it despite the fact he was obviously against the Communism that plagued the East at the time. (Again the conflation of Socialism and Communism is still a thing people do for some reason.). 1984 always struck me as being about authoritarianism/totalitarianism in general rather than being about one specific party. Given the current cultural dialogue I tend to zone out whenever the novel is mentioned because people aren't really interested in the broader concept of what Orwell was writing about but rather telling the world about how either side of the political spectrum is Orwellian because a moderator on a specific site removed their overtly malicious post or Twitter called out their trash broadcast. That all being said how is the film? I'm a fan of the novel and Orwell but I've not seen it. Deakins is obviously a big draw for me as well. It is definitely about authoritarianism and totalitarianism but with the interesting twist that instead of treated as interchangeable cogs in the machinery the process is much more insidious and personally focused with everyone is being urged to 'play their part' in the running of the society (whilst still remaining interchangeable and 'disappearable' on an individual level). The power structures are in the process of being internalised: dictionaries are having their 'flowery' poetic words discarded in favour of ever dwindling amounts of practical compound words; children are encouraged to inform on their parents; the television screen is not a one way interaction any more, is unable to be turned off and everyone watches the same few shows collectively (like Britain's Got Talent! or a Marvel movie!). News is manufactured to order with the conceit that nobody remembers the news from yesterday anyway, so any new story is possible. The power of 1984 is that you can apply it to anything that comes after it from Mao's China and the Little Red Book to Thatcher's "there's no such thing as society" to Trump's 'fake news'! Even 'body fascism' of the state getting more involved in the mechanics of your body and monitoring everything that you say, watch and eat, perhaps more for their benefit than for your own health. And it still has weird resonances today: for example that recent home cycling advert is astoundingly unaware of how uncomfortably (and presumably unintentionally?) it is reminiscent of a certain exercise scene in the film! It is not enough that you submit in public but might think differently in private, but that you do not have any existence at all outside of the one assigned to you. And that allows your existence to change entirely depending on the whims of others. It is perhaps John Hurt's finest role. Suzanna Hamilton is amazing too, and of course Richard Burton has the perfect mix of gruff father and dispassionate bureaucrat as he breaks Winston (and the structure of society) down and re-builds him in the final section. Looks like Criterion reassigned the spine #s - this is now #984. They no doubt read this forum.